Today we will summarize something I�ve been thinking about for a long time. Exactly how will we get from the credit crisis, which I think is coming in the next 12�18 months, to what I call the Great Reset, when the global debt will be �rationalized� via some form of nonpayment. Whatever you want to call it, I think a worldwide debt default is likely in the next 10�12 years. I began this tale last week in Credit-Driven Train Crash, Part 1. Today is Part 2 of a yet-undetermined number of installments. We may break away for a week or two if other events intrude, but I will keep coming back to this. It has many threads to explore. I�m going to talk about my expectations given today�s reality, without the prophetically inconvenient practice of predicting actual dates. Also, while I think this is the probable path, it�s not locked in stone. Later in this series, I�ll describe how we might avoid the rather difficult circumstances I foresee. While it is difficult now to imagine cooperation between the developed world�s various factions, it has happened before. There are countries like Switzerland that have avoided war and economic catastrophe. We�ll hope our better angels prevail while taking a somber look at the more probable. The experts who investigate transport disasters, crimes, and terror incidents usually create a chronology of events. Reading them in hindsight can be haunting�you know what�s coming and you want to scream, �Don�t do that!� But of course, it�s too late. We do something similar in economics when we look back at past recessions and market crashes. The causes seem obvious and we wonder why people didn�t see it at the time. In fact, some people usually did see it at the time, but excessive exuberance by the crowds and willful ignorance among the powerful drowned out their warnings. I�ve been in that position myself and it is quite frustrating. Again, the precise route and speed are uncertain, but the probable destination is not. Consider this a kind of �road map� to orient us for the journey. Now, let�s look at each stage. Last week, I described how legendary railroad engineer Casey Jones was barreling along when an unexpected train appeared ahead. He saved his passengers at the cost of his own life. Today�s high-yield bond market has no such hero, and I think the crisis will begin there. This time, I believe the collapse will go deeper and happen faster because Dodd-Frank has decimated market makers� ability to cushion it. Likewise, the Fed will be reluctant to bail out ridiculously priced bonds like WeWork and its many covenant-lite, unsecured brethren. And rightly so, in my view. � the trigger for a crisis could be anything if the system as a whole is unstable. Moreover, the size of the trigger event need not bear any relation to the systemic outcome. The lesson is that policymakers should be focused less on identifying potential triggers than on identifying signs of potential instability. This implies that paying attention to macroeconomic �imbalances� may pay bigger dividends than trying to assess financial instability through highly disaggregated �risk maps� of the sort currently being encouraged by the G20 and the IMF. The latter are not only expensive to monitor, but potential rupture points in the financial fabric can change rapidly in real time. As I will show in this letter and others, the system itself is unstable. Predicting the actual trigger in advance is difficult. I can imagine numerous possible �triggers� for the coming credit crisis. 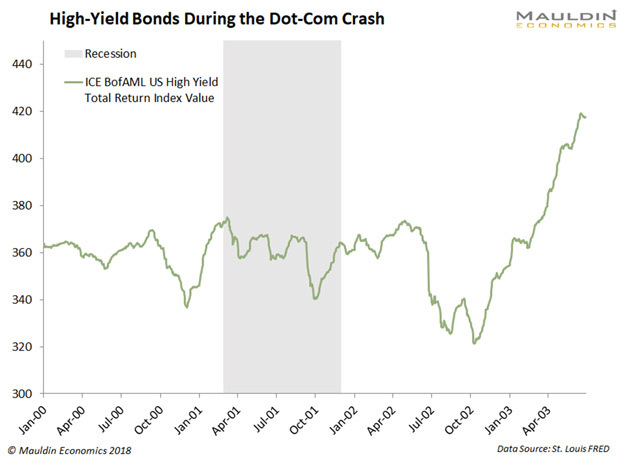 As in the biblical book of Revelation, the initial credit crisis stemming from the fall of high-yield bonds will be merely the beginning of woes. Illiquidity will spread as lower-end corporate bonds fall to junk ratings. Legal and contractual constraints will then force institutions to sell, pressuring all except the highest-grade corporate and sovereign bonds. Treasury and prime-rated corporate bond yields will go down, not up (see 2008 for reference on this). The selling will spill over into stocks and trigger a real bear market�much worse than the hiccups we saw earlier this year. 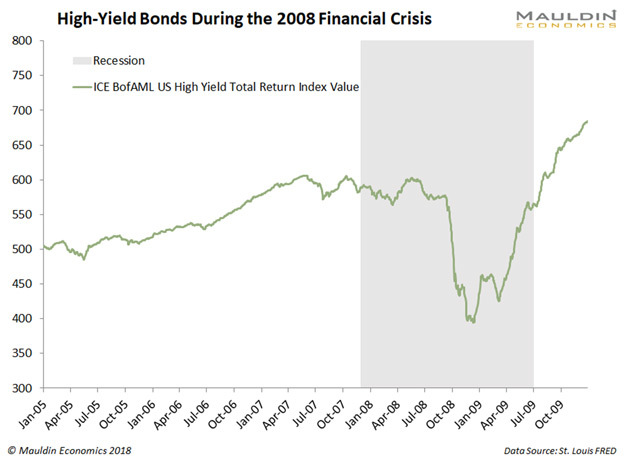 I give the probability of the credit crisis in the high-yield junk bond market somewhere close to 95%. For the record, nothing is 100% certain, as we don�t know the future. But I think this is pretty much baked in the cake. As always, a US recession will spark higher federal spending and reduce tax revenue, so I expect the on-budget deficit to quickly reach $2 trillion or more. Within four years of the recession�s onset, total government debt will be at least $30 trillion, further constraining the private capital markets and likely raising tax burdens for everyone�not just the rich. Needless to say, the working-class population will not like this and it has the power to vote. �Safety net� programs and unemployment benefit expenditures will skyrocket. 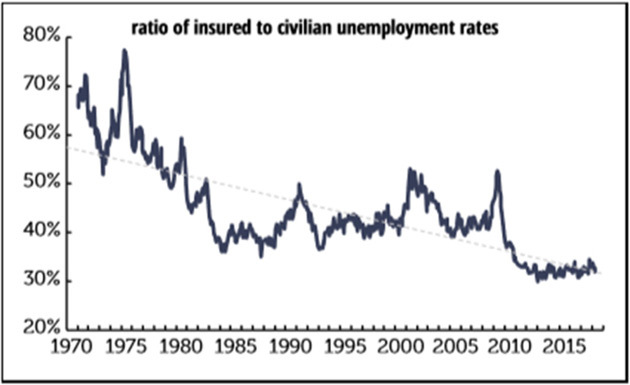 The chart below from Philippa Dunne of The Liscio Report shows the ratio of workers covered by unemployment insurance is at its lowest level in 45 years. What happens when millions of freelancers lose their incomes? The likely outcome is a populist backlash that installs a Democratic Congress and president. They will then raise taxes on the �rich� and roll back some of the corporate tax cuts and increase regulatory burdens. They may even adopt my preferred consumption-oriented Value Added Tax (VAT)� but without the �reduce income taxes and eliminate payroll taxes� part that I suggested in 2016. At a minimum, this will create a slowdown but more likely a second recession. Recall (if you�re old enough) the back-to-back recessions of 1980 and 1982. That was an ugly time for those of us who lived through it. Of course, that presumes a recession before the 2020 election. It may not happen�I put the odds at about 60�70%. Also, it is possible the Democrats will fumble what for them will be a golden opportunity. I�m not sure Republicans should view that as a �win� because they will then have to deal with the eventual recession themselves instead of being in opposition. I think by the latter part of the 2020s, US total government debt will be at $40 trillion. You think Washington is paralyzed now? You�ve seen nothing yet. My friend Neil Howe thinks we could see a socially conservative, fiscally liberal party gain power. (Some would argue one already did, given the current GOP�s spending binge.) But in any scenario, I see very little chance the federal government will shrink or reduce its impact on the economy. That is already a big problem and will only grow. Unemployment may approach the high teens by the end of the decade and GDP growth will be minimal at best. What do you call that condition? Certainly not business as usual. Long before that happens, the Federal Reserve will have engaged in massive quantitative easing. There�s a lot of misunderstanding about QE, so let me clarify something important. Quantitative easing is not about �printing money.� It is buying debt with excess bank reserves and keeping that debt on the Fed�s balance sheet as an asset. The Bank of Japan is an example. They did not put currency (yen) into the market. That�s how Japan still flirts with deflation and its currency has gotten stronger. QE is the opposite of printing money, though there is a relationship. That�s one reason central bankers like it. As this recession unfolds, we will see the Fed and other developed world central banks abandon their plans to reverse QE programs. I think the Federal Reserve�s balance sheet assets could approach $20 trillion later in the next decade. Not a typo�I really mean $20 trillion, roughly quintuple what they did after 2008. They won�t need to worry about the deflation that usually accompanies such deep recessions (dare we say depression?) because the Treasury will be injecting lots of high-powered money into the economy via deficit spending. But since we have never been in this territory before, I must say this is only my guess. If that�s what they do, will it work? No. The world simply has too much debt, much of it (perhaps most) unpayable. At some point, the major central banks of the world and their governments will do the unthinkable and agree to �reset� the debt. How? It doesn�t matter how, they just will. They�ll make the debt disappear via something like an Old Testament Jubilee. 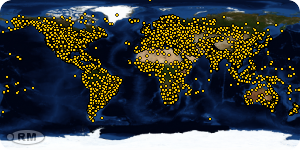 I know that�s stunning, but it�s really the only possible solution to the global debt problem. Pundits and economists will insist �it can�t be done� right up to the moment it happens�probably planned in secret and announced suddenly. Jaws will drop, and net lenders will lose. While all that is brewing, technology will keep killing jobs. Many mainstream commentators and serious analysts like Karen Harris (see The Great Jobs Collision) are projecting that 20�40 million jobs will be lost in the US alone and hundreds of millions across the developed world. As we get into the 2020s, the presidency and Congress will again be whipsawed, and we will begin to discuss Bernie Sanders� �crazy� universal basic employment idea, or others like it. By then, the idea will not be considered crazy, but the only feasible choice. Even conservative politicians can see the light when they feel the heat. I keep coming back to this train-wreck metaphor because it fits so well. I said Casey Jones plowed into a train that wasn�t supposed to be there. The full story is a little more complicated. Railroads in 1900 knew the danger of collisions. They took extensive precautions to make sure it didn�t happen. The stopped train in front of Casey Jones had pulled off onto a siding like it was supposed to. The error was that its last four cars were stuck on the main line because an air hose had broken, locking their brakes. This is a good analogy for our financial system. We know bad things can happen. We have systems to prevent them and limit their damage. Those systems are only as good as the people who manage them� and even then, surprises happen, and the safeguards fail. What broken air hose will push the financial system close to collapse and bring on the Great Reset? I don�t know, nor do I know when it will break. But I�m quite sure it will happen. Now is the time to get ready. There�s no Casey Jones to save us. Winston Churchill said America always does the right thing�after we try everything else. Maybe we can find that middle and �work it out� before the crisis. America has shifted before. Maybe that�s only a dream, but it�s one we better hope comes true. In later letters, we will talk about how to protect your portfolios and trade through the coming crises. You don�t have to go gently into that good night. You can get off the train. There is plenty of time, but you need to start planning now. 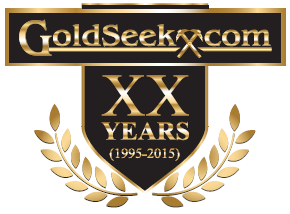 A quick note to anyone who had trouble with last week�s offer on the Dragon Professional speech recognition software. A technical problem kept some of you from getting the 50% discount I had arranged. That is now fixed, so please try again if you were deterred. You can click here or call Nuance customer service at 888-781-1189 to order. Dragon greatly increased my writing productivity and I know it will help yours, too. Next week, I go to Raleigh, North Carolina, where I�ll see some old friends like Mark Yusko and speak at The Investment Institute. Then in June, I�ll be in Cleveland for an overdue medical checkup with Dr. Mike Roizen. I then intend to stay home, write, rest, and workout for June and July. I�m sure something will intrude, but that is the plan as of now.